I had been in and out of the hospital for months. At 6 weeks, they told me you weren't going to make it. At 8 weeks, they said there was a good chance that even if you did make it, you'd have a lot of problems. At 12 weeks, they put me on bedrest. 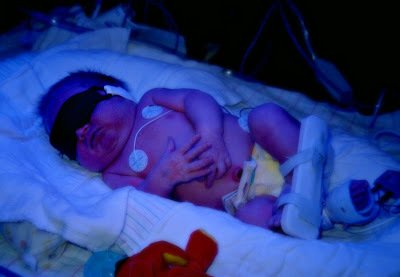 At 16 weeks, I was admitted to the hospital for preterm labor. I got a lot of shots, an ultrasound, and a prescription for terbutaline. We negotiated with the doctor, and made arrangements with the family and neighbors, then I was allowed to go home and lay on the couch. At 18 weeks, I started bleeding. I went back to the hospital. I got shots, they stopped the labor, and told me that I was allowed to go to the bathroom. That's it. At 20 weeks, they told me congratulations, they never thought I'd make it this far. Between weeks 20 and 30, I was admitted to the hospital about 5 more times. It was harder to stop labor each time. Week 30 hit, and I was back at the hospital. I started in the ER, where they sent me up to L&D to make sure I wasn't in labor. I wasn't. So L&D sent me back to the ER where they ran tests, and tried to get ultrasounds of my kidneys, gallbladder, and appendix. They couldn't figure anything out, so they gave me a morphine drip. As I was lying in bed, where I had been for the last 6 hours, I again, went into labor. A nurse started timing my contractions. Every two minutes, lasting just about as long. They took me back upstairs and gave me more shots. This time they gave me magnesium. They finally got things to stop, and I was given the option to lay in bed there, or lay in bed at home.... I went home. Week 32. My water broke. I went back to the hospital and they started doing tests. They couldn't stop you from coming anymore. They needed to keep me in labor for at least 4 hours, so that I could get in two rounds of antibiotics, but you were feisty. When my water broke, every drop of amniotic fluid that was around you spilled out. To help with birth, they did amnioinfusion. At 10:41 am, you entered the world. In complete and total silence. 7 lbs, 5 oz. Two months early. Your head and neck were black with bruises. You were struggling to breathe, so was I. The Pediatric team took you away. The nurse started talking to me, but I couldn't hear what she was saying. A few hours later, they took me to see you. You were hooked up to IV's, and monitors. Cords were everywhere. You were under an oxygen tent. I asked if I could hold you. I couldn't. One of the nurses explained why. "It's like when you get the flu. You're achy, and everything hurts. Even wearing clothes hurts, it's irritating. That's what it's like for her. Even though you want to touch her, it hurts too much right now. You can hold her hand." So I did. I stayed with you as long as I could. But I was discharged a few days later. We came to see you every day. I would bring Tad and Blayne and Daniel, and they would look in the windows. They thought you were so cool because you got to wear special sunglasses under the blue lights. I came alone in the evenings to hold your hand. Eventually, you upgraded from a feeding tube to a bottle. And you were taken off IV's. And then, on day 13, you woke up. All of the sudden, you were alert, and wanted to eat, and started crying. With every minute, you got stronger. On day 14, you passed the carseat test. They put you in a carseat, hooked up to all the monitors, and put it on a vibrating table. For 30 minutes, that table shook you, and not once did your vitals go wonky. On day 14, you got to come home. And we have been loving you ever since.